Nearly two years after the Mumbai terror attacks, security concerns dominate Indian views of Pakistan. Fully seven-in-ten see their neighbor as a very serious threat to their country. Nearly six-in-ten believe that Pakistan is actively supporting extremist groups such as Lashkar-e-Taiba, an organization that a plurality considers the greatest threat to their country. And a wide majority worries that extremist groups could take control of Pakistan. Despite substantial security concerns and largely negative views of Pakistan, a majority of Indians, particularly those who are more educated, believe in the importance of improving relations with Pakistan and support further diplomatic talks and economic ties between the two countries. Only 13% of Indians give Pakistan a positive rating, while slightly more than eight-in-ten (81%) have an unfavorable opinion of their neighbor. Attitudes toward Pakistan have turned slightly more negative since last year, when 18% expressed a favorable and 73% had an unfavorable view. Indians are the least likely to have a positive opinion of Pakistan among the 10 countries where this question was asked. Pakistan receives significantly better marks in some predominantly Muslim countries, although Indonesia is the only country in which a majority expresses a favorable opinion. While few Indians have a positive view of Pakistan, a strong majority (83%) agrees that it is very (49%) or somewhat (34%) important that relations between the two countries improve. Only 11% consider this unimportant. Even though majorities among all education and income groups believe in improving relations, highly educated Indians are more convinced than those with less education. Among those with at least some college education, 85% believe in the importance of improved relations, while 12% disagree and only 3% are unsure. Roughly seven-in-ten (69%) of those with a primary education or less believe in the importance of improving relations between India and Pakistan, while 13% disagree and 18% do not have an opinion on the issue. Not only do most Indians see the importance of improving relations with their neighbor, majorities also support further talks to reduce tensions (63%) and believe that increased trade and business ties across the border would be a good thing (63%).3 More educated Indians are particularly supportive of increased trade and better business ties – 66% of those with at least some college education see increased economic ties as a good thing, compared with 54% among those with a secondary education or less. 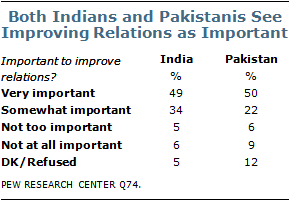 Looking at Pakistani public opinion regarding relations with India, 72% believe in the importance of improved relations with India, while 15% disagree and 12% are unsure of their stand. More than three-fourths among Pakistanis support further talks between the two countries (76%) and see increased trade ties as a good thing (77%). For decades, the dispute over Kashmir has been central to relations between India and Pakistan, and today more than two-thirds (69%) among Indians see the situation as a very big problem in their country. Roughly nine-in-ten Indians (91%) consider it important that the dispute over Kashmir be resolved, and 65% say it is very important. 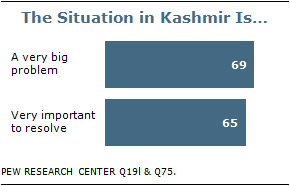 Large majorities across all demographic groups support resolving the Kashmir issue. Yet, as in the case of views on improved economic and political relations with Pakistan, the well-educated are especially likely to hold this view. More than nine-in-ten (92%) among those with some college education or more see the importance of resolving the issue. Among those with a primary education or less, nearly three-fourths (74%) say the same. When asked about the importance of resolving the Kashmir issue, Pakistanis also overwhelmingly say it should be a priority: 90% believe it is important, including 79% who say it is very important. Recent terror attacks, domestic disturbances and the general volatility of the South Asian region raise constant security concerns among Indians. Majorities consider Pakistan, the Islamic extremist group Lashkar-e-Taiba, Maoist groups known as Naxalites and China as at least somewhat serious threats to their country. 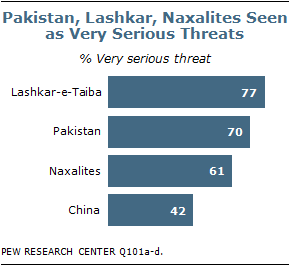 Indians are particularly likely to consider Lashkar-e-Taiba as a very serious threat to their country (77%). The group has claimed responsibility for several terrorist attacks on Indian soil and has been widely blamed by the government for the 2008 Mumbai attacks. Seven-in-ten Indians also say Pakistan is a very serious threat. Naxalites, who have engaged in frequent violent insurgencies in the country, also attract significant concern (61%). Indians are relatively less concerned about the threat posed by China – slightly more than four-in-ten (42%) consider China a very serious threat – despite the history of military conflict between the two countries. When asked to name the greatest threat to their country – among Lashkar-e-Taiba, Pakistan, Naxalites and China – a 42% plurality of Indians say Lashkar-e-Taiba. One-third name Pakistan and 16% choose Naxalites. Only 3% believe China is the greatest threat. The Indian government has widely alleged that Lashkar-e-Taiba is closely linked with the Pakistani government, and the Indian public agrees; nearly eight-in-ten (79%) believe that Lashkar-e-Taiba is actively supported (58%) or tolerated (21%) by the Pakistani government, while only 12% believe that the Pakistani government is opposing the group. Among those who believe the Pakistani government supports or at least tolerates extremist organizations, 79% say that if there is another terrorist attack on India by these groups, India should take military action against them in Pakistan. Not only are Indians concerned about the Pakistani government supporting extremist groups, they also continue to worry that such groups may take control of Pakistan. A strong majority (78%) are at least somewhat concerned about this, including more than half (53%) who are very concerned. Only 14% of Indians say that they are not worried about extremist groups taking control of Pakistan. Among Pakistanis, slightly more than half (51%) also express this concern, while three-in-ten (30%) say they are not too or not at all worried about extremist groups taking control over the country. In line with the high levels of perceived threat from Lashkar-e-Taiba, nearly nine-in-ten Indians express concern about Islamic extremism both in their country and around the world. Fully 86% of Indians say they are concerned about Islamic extremism in the world and 54% are very concerned about this. A similar proportion worry about Islamic extremism in their country (88%) including more than half (54%) who express a high degree of concern. Compared with other countries where the question was asked, Indians are more likely to express concern about Islamic extremism. In particular, Indians are more likely to say that they are very concerned about extremism, both at home and around the world.